This house smelled terrible, this room in particular. 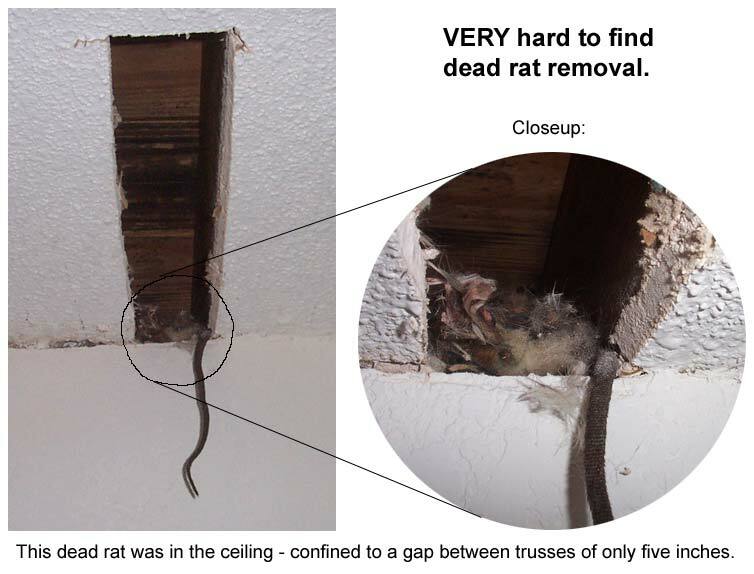 There was no attic (it was a flat roof) and no crawl space, so I knew the dead animal was in the wall or ceiling. As I always do, I sniffed and sniffed like a dog, until I had it narrowed down to one spot. When I started to cut, I noticed that the ceiling joists were only inches apart. Amazingly, I had cut in the one exact small spot where the rat was - a nearly impossible to find place - and, as always, the first and only hole I had to cut in the home. Once again, I sniff like a blood hound until I find the right spot, then get it perfect with my very first cut into the wall. Small animal, but BIG smell! 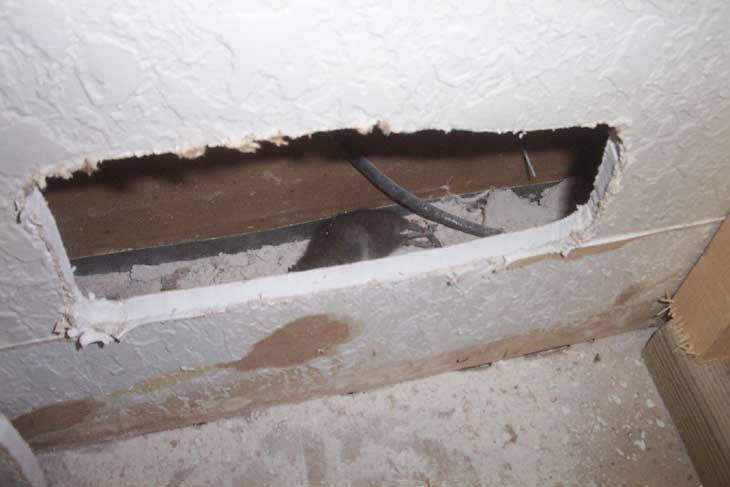 Rats and mice love to live in buildings, in the ceiling and walls, and so when they die (and they frequently die, since they rarely live more than a year) they die in the ceiling or wall. Sometimes they fall down a wall and can't climb back up, and die at the bottom, such as in the above pictured case. The length of the decay process depends on the size of the animal, the temperature of the area, and so on. Regardless, these small rodents cause a strong odor. If they fall down a wall, there's no ventilation, and most of the odor goes right into the building. Removal of the dead rat or mouse carcass is the only way to get rid of the stench.